Well hello winter, I’m ready to have to leave now. 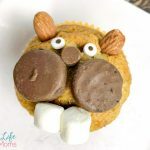 It’s brutally cold here but as a reminder that Groundhog day will be approaching, I thought it would be fun to create these Groundhog banana muffins. 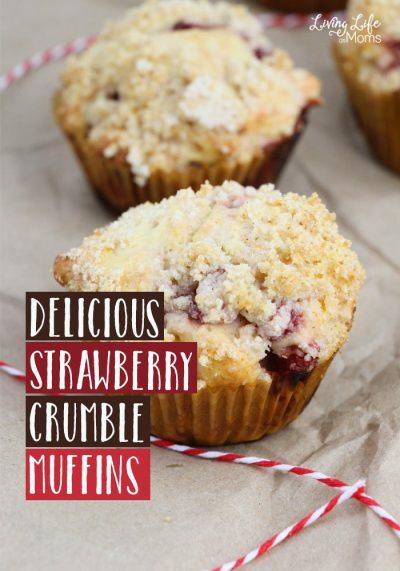 I’m a huge fan of adding fruit to dessert, I especially love them in muffins because they make them more moist. 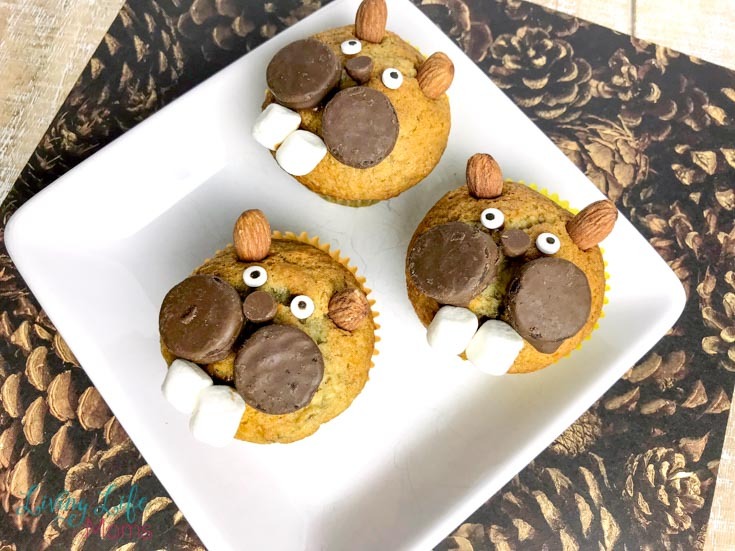 While banana muffins are a favorite in this house, turning them into groundhogs was just a bonus. 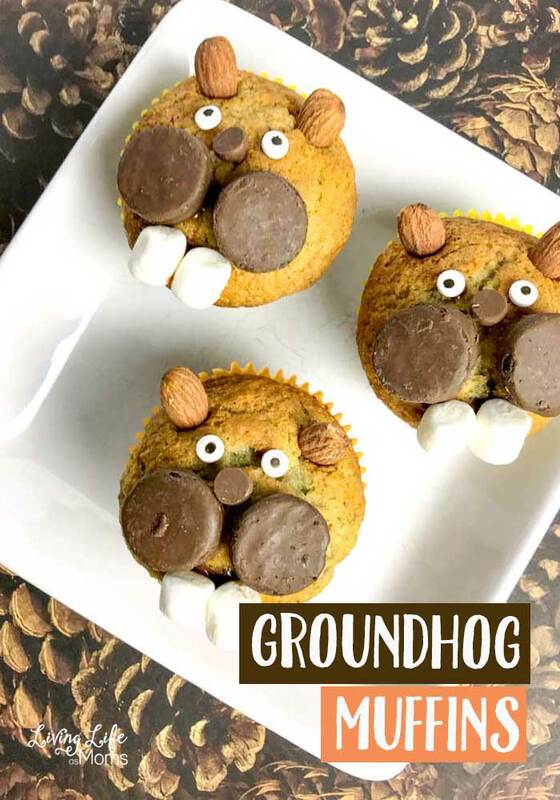 You can bake these on Groundhog day or as you’re learning about groundhogs in general. Maybe even see how this whole tradition started and see why there’s an actual Groundhog day. While you’re learning, these are the perfect treat for any winter day because the kids can help you make them. They could probably do it on their own if you have older kids. Preheat oven to 350 degrees. Prepare a 12 cup muffin tin with cupcake liners. Spritz with non-stick cooking spray. 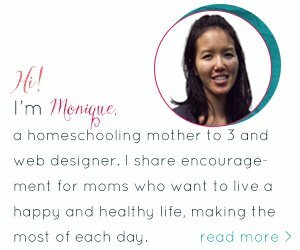 In a large mixing bowl, whisk together the flour, baking soda, baking powder, and salt. Create a well in the center. In a separate bowl, whisk together the bananas, melted butter, and vanilla. Add the egg and whisk until well blended. Pour the banana mixture into the well of the dry ingredients. Stir just until combined. Using an ice cream scoop, divide the batter among the 12 cupcake liners. Press the pointed end of an almond into the muffin to resemble a small ear. Repeat to create a second ear. In the middle of the muffin, line up two fudge-covered mini Oreo cookies to be the groundhog’s cheeks. Press a chocolate morsel of the top where the Oreos meet to serve as the nose. Above the nose, place a candy eye on each side. To attach the miniature marshmallows, melt 1 tablespoon chocolate morsels and use a toothpick to apply a small amount of chocolate to each marshmallow. Press the marshmallow against the muffin below the “cheeks” using the chocolate as glue. Look how cute they turn out? You can’t help but want to eat them, they’re adorable. It makes this treat even more fun. 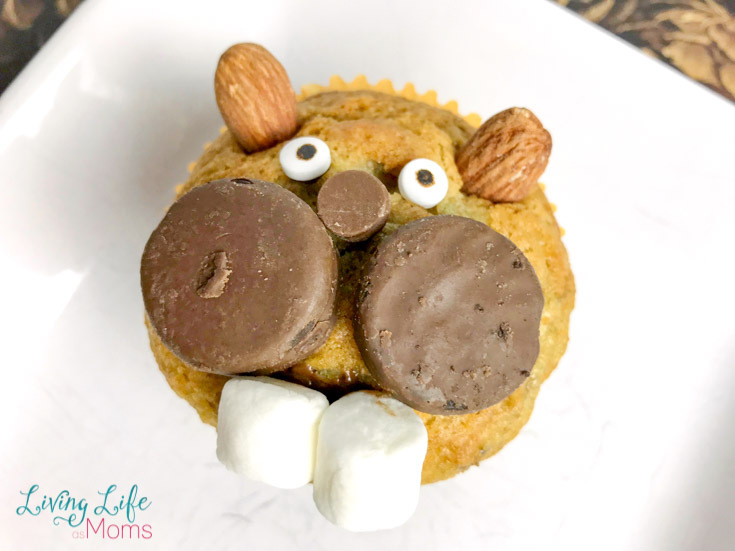 Have the perfect baked treat this winter with these cute Groundhog banana muffins. You can’t go wrong here.